A full sized tool is always the ideal option, but it is not practical to carry your entire toolbox on the road with you. Having a single compact tool that can be used to get you out of a bind is going to be the key on road trips, especially those that involve camping, hiking, or fishing. Multi-tools are pocket-sized devices that can have a myriad of tools on one unit, but figuring out which tool is best for your daily needs can be a tedious task. We have compiled a list or some of the features that you may want to consider as well as reviewed four picks that may be exactly what you are looking for in a multi-tool. Leatherman has been dedicated to making high quality, hand crafted multi-tools since 1983. Today, they still strive to produce the same level of dedication with each and every tool that they produce. The MUT multi-tool is a great example of the quality craftsmanship displayed in their products, and one of the reasons it was selected as our top pick on this list. This tool is designed for tactical personnel or someone with a military background to use. Why is this you may ask? Well, there are only a few multi-tools on the market that have a bronze carbon scrapping tool on them, and the MUT multi-tool is one of them. This tool is designed to scrape away and remove the carbon build up that can be found on hand guns and other firearms. There is also a firearm disassembly punch that is designed to make cleaning you r gun a quicker process. This unit is also a great tool for an electrician to have, as it has a wire cutter as well as a wire crimper. Both the regular wire cutter and the hard wire cutter are replaceable. There is also a replaceable cutting hook as well for your convenience. There is also a large bit driver to tighten screws that are loose. 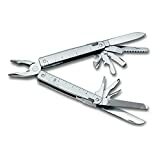 Like most multi-tools, the MUT comes with a set of regular pliers as well as a set of needle nose pliers for when you need to work with small objects. There is also a saw and a hammer included in the tool, just in case you need to do some construction while you are away from home. A bottle opener is another feature that will come in handy. With all of these features in this one tool, you can imagine that it is a bit heavy to carry around on a daily basis. It weighs about 11.02 ounces, which can get heavy in your pocket if you are not use to the extra weight. The entire tool is constructed from high carbon stainless steel, which is a material that is even more durable than typical stainless steel, and the best part is that since the tool is made from this material, it will be resistant to corrosion and rust. The MUT comes with a carabiner to easily attach the multi-tool to your belt. It comes with a molle sheath that can either be black or brown, and an adjustable wrench is also included in the packaging. Leatherman is a company that truly stands behind their products, so they have included a 25 year warranty to cover the costs of any repairs or replacements that need to be done. 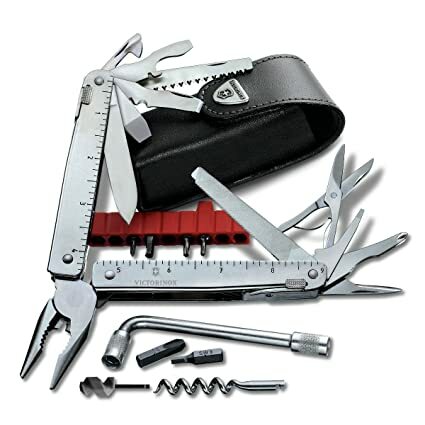 Victorinox Swiss Army has been manufacturing durable high quality hand tools since 1884. They are the originators of the multi-tool and four generations later the Elsener family is still bringing exceptional multi-tools to the market. Our silver pick, which is the Swisstool Swiss Army Knife, is a great multipurpose device that features 37 different tools. The tool comes complete with a corkscrew that can be used to open your wine bottle. If you prefer other drinks, there is also a bottle opener and a can opener on this tool as well. It also comes with a wood saw, a metal saw, and a metal file that help you cut things down to the size that you need them to be. When the unit is laid flat, the handles double as a ruler. If you happen to need to clip coupons on the go, there is a pair of scissors in this tool as well. It also includes a chisel, a Phillips head screwdriver, a miniature screwdriver, and a spirit edge blade. As with most multi-tools, there is a flathead screwdriver in this tool as well; this comes in four different sizes, including two millimeters, three millimeters, five millimeters, and 7.5 millimeters. In addition, there is also a wire cutter, a hard wire cutter, a wire bender, needle nose pliers, and a reamer. The last feature that you will want to be aware of is the bit wrench and the bit case, which includes these bit sizes: Hex 3, Hex 4, Phillips 0, Phillips 3, Torx 10, and Torx 15. 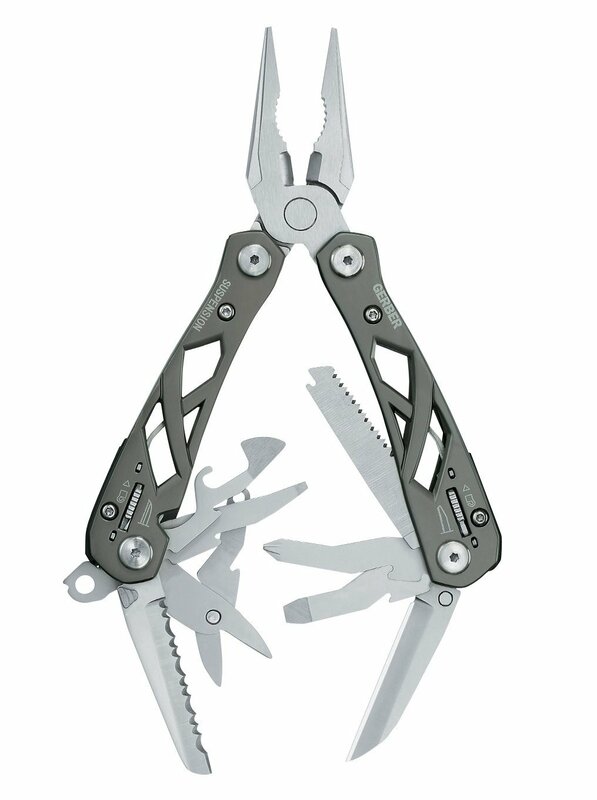 This multi-tool is constructed from a stainless steel material that is designed to be durable. It is 4.5 inches in length, which is slightly longer than may tools of this type, and it weighs ten ounces, which is a great weight for a pocket tool. All of the features and individual aspects of this tool lock into place when in use, which is a great way to prevent accidents from occurring. In addition, the manufacturer has taken the warranty of this tool to the next level with a full lifetime warranty, which means the company stands behind their products. Our bronze pick is another great multi-tool that comes to us from the same manufacturer as our gold pick. 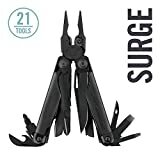 The Leatherman Surge is actually designed as the second largest multi-tool in the Leatherman line of multi-tools. It is about 5.2 inches in length, and it weighs about 15.2 ounces, which means that it is a bit bulky, but it will not seem so big when it is attached to your belt. One of the reasons that it is a bit on the heavy side, is the fact that it has 21 different tools. To start, the tool has both needle nose pliers and regular pliers to accommodate your needs. It comes with a pair of spring loaded scissors and a ruler. There are two different knives in this tool, one has a serrated edge, and the other one is straight. In addition, there is a wire cutter, a wire stripper, an electrical crimper, and a saw that can assist you with your electrical needs. There is also a diamond coated file, a bottle opener, a can opener, a bit driver, and a blade exchanger. If you need to tighten a loose screw, there are two different sizes available on this tool as well. 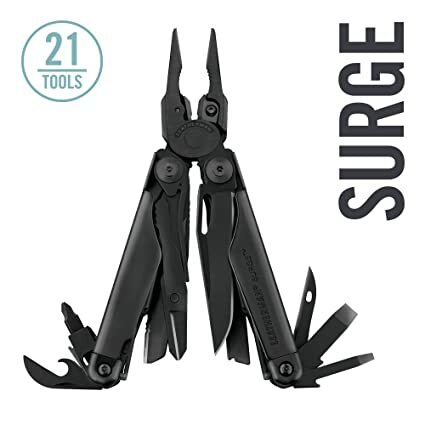 This Leatherman surge is a tool that is created from high carbon stainless steel that is designed to protect the exterior of the device from becoming corroded or rusty. This high carbon material is actually much stronger than traditional stainless steel, so the tool should last you for decades. The entire multi-tool is coated with a thin layer of black oxide, which is a coating that is often used on military weapons and materials to decrease the shine and reduce the glare from the sun. When you purchase this product, it comes with a molle sheath, which is quite possibly because of its extra large size. In addition, a 25 year warranty is included to cover the cost of any repairs or replacements that may be required. Our final pick is the Gerber Suspension, which is manufactured from a company that has been dedicated to providing the public with quality products at a low price point since 1939. Since then, Gerber has remained one of the most trusted knife production companies across the nation. Our ballin’ on a budget option has 12 different internal components that are designed to make your life a little easier. The multi-tool includes needle nose pliers to help you grip small items that need to be repaired. It also features a plain edged knife and a serrated knife to accommodate your needs; in fact, it you need to cut material that is a little more durable, there is even a saw and wire cutters included in this tool. If you find that you need a screwdriver, you will be prepared, as there is a Phillips heads screwdriver, a small flathead screwdriver, and a medium sized screwdriver to assist your needs. A can opener and a bottle opener are also included, which will be a great tool to have on a hunting or camping trip. There is a lanyard hole on the tool that you can use to attach the device to your belt, and it comes with a nylon sheath that serves as a place to store the tool while it is not in use. The Gerber Suspension features a stylish open frame design that is crafted from stainless steel. Even though the frame is open, the stainless steel construction makes the entire device resistant to rust and corrosion, which means that if it happens to get wet, the blades will not be ruined. It is an extremely lightweight unit, weighing in at only 9.6 ounces. In addition it is built with a contoured handle that is designed to give you a comfortable, more ergonomic grip than some of the lower costing multi-tools on the market. To ensure your safety as you use the tool, there is a Saf. T. Plus locking system in place that ensures that the blades do not move. Gerber has created quite a durable product, so they have also included a lifetime warranty to cover the cost of any issues that may arise as time goes by. • Pliers – These can be used to grip items or bend them if needed. They can be flat nosed or needle nosed, but if you tend to work with smaller items, then you may prefer to have needle nose. Some pliers have wire strippers included as well if that is a tool that you may need. • Knife – The blade that is incorporated in your multi-tool can either be a serrated blade or a plain edged knife. A straight edge is good for peeling fruit, and a serrated edge can be used to cut through items like ropes. It is good to have both types of blades on your multi-tool if you can. It is also beneficial to have a saw blade that can be used on thicker rope or to saw limbs from a tree for kindling. • Screwdriver – Most multi-tools have flat head screwdrivers, but it is also beneficial to make sure that you have a Phillips head as well. • Can opener – This is a great feature to have when you are hiking or camping in the woods for a few days. Most can openers can also be used to open bottles. • Scissors – These can be a handy tool to have in the event that you break a nail. You can easily trim the broken nail without injuring yourself further. • Keychain – This type of multi-tool is the smallest option available. It may not have all of the bells and whistles of a larger one, but since it is attached to your keys, it will never be left at home. • Pocket – This type is slightly larger, but it is still lightweight and easily carried in your pocket, backpack, or messenger bag. • Belt – These are typically larger and more durable than those we have already discussed. They may not offer more tools, but they do offer them in full sized varieties instead of miniature. No matter how good the multi-tool that you choose is made, parts of it will be used more frequently, which will cause them to wear faster. If you can simply replace certain parts of the tool, then you can extend the lifespan of it. For example, maybe your blade is dull or your screwdriver is stripped, then if you can loosen the handle to remove those parts and replace them with new ones, your multi-tool will almost be as good as new. You will also want a tool that can be tightened, as the mechanics of the mechanism will loosen with use over time. How well is the multi-tool made? Some models use thin metal in their construction, while others use something a bit more durable. You want to find a tool that is built strong enough to last more than a few years. Also, make sure to consider factors like rust. Some metals rust more readily than others, and you don’t want your tool to degrade from it, so look for a strong, sturdy build material. One way to know that the tool is designed well is that the manufacturer backs it with a warranty. Some warranties are only good for a year or so while others can last for the lifetime of the tool, make sure that the multi-tool you purchase covers more than the minimum; in fact, if you can snag up a lifetime warranty, then it will be well worth the investment. You never know when you are going to need a tool, and having a multi-tool with you on a daily basis can help make your life a little bit easier. Maybe a small screw in your glasses is loose and you need a small screwdriver to tighten it, or maybe your fishing line becomes tangled amongst the rocks and a knife would come in handy. Regardless of your need, a small multi-tool that you can carry with you can be a lifesaver is certain situations. Decide what features are the most important to you, and then see if you can find a multi-tool that has those components. Maybe one of our picks is perfect for your needs, or perhaps you need to go back to the drawing board and use our pre-purchase considerations to help you select a multi-tool that will give you years of use.